Wendy Baines P.T., B.Sc.PT, M.C.P.A. Wendy is the owner and registered physiotherapist at this clinic. She is registered with the College of Physiotherapists of Ontario (Reg. #5408) and a professional member of the Canadian Physiotherapy Association and the Ontario Physiotherapy Association. She graduated from the University of Toronto in 1981 and has worked as a full-time physiotherapist, locally since then. She will be your source for pain management, treatment and rehabilitative care. Her background includes 12 years as physiotherapist and Director of Rehab Services in a hospital setting as well as a number of short term and relief positions in a variety of private clinics and rural community hospitals. In 1994, Wendy opened her own independent private practice… Her vision continues to be to provide and support community based multi-disciplinary healthcare through knowledge, collaboration, compassion and partnership. She is married, has 2 wonderful, grown children, a son-in-law, daughter-in-law, 3 grandchildren and a ‘grand’ dog. She loves to walk, swim, do Yoga and Zumba. She also loves to spend time with family and friends and dabble in sewing and photography when time permits. Janet is a registered Kinesiologist. Janet is here to ensure a smooth return from clinic rehabilitation to everyday life. She is also responsible for the role of Physiotherapy Assistant with application of modalities. She graduated in June 2004 from University of Western Ontario with a Bachelor of Arts in Honors Kinesiology. Janet is registered with the College of Kinesiologists of Ontario (Reg. #13078) and is a professional member of the Ontario Kinesiology Association (#08506). She has been an active member in our health community for 8 years working with seniors in Long-Term Care and leading fall prevention classes. Cathy is our friendly face you will meet upon arrival at our clinic. 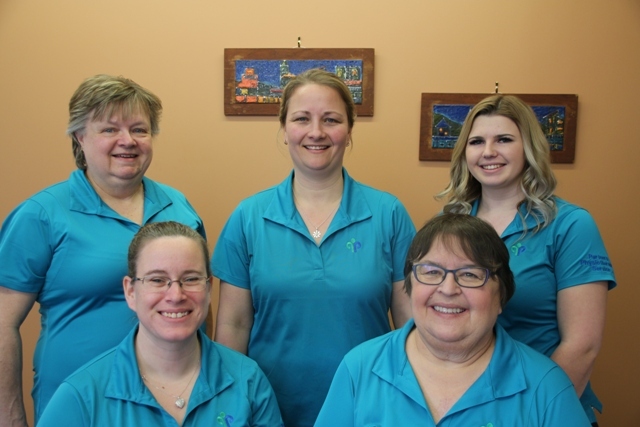 Administrative support provided by Cathy will help ensure your physiotherapy treatment plan goals are met. She will ensure appointments best suit your schedule and meet the goals of your treatment plan, process extended health care billing submission and co-ordination of benefits. Cathy has over 10 years of experience in administration in various roles and supportive functions. Kailey is our other friendly face to welcome you and provide administrative support including scheduling and payments. She will also ensure the goals of your treatment plan are met, process extended health care billing submission and co-ordination of benefits. Kailey is currently in her second year at Georgian College studying Executive Office Administration, along with specializing in psychology studies. Marilyn is our Bookkeeper with 20+ Years of Financial Experience in Healthcare organizations. She has a certificate in Financial Management for Healthcare Organizations.